Entry filed under: Dog Stuff, From Under The Desk, Quilting News. My cats try to get into my suitcase when it is open on the bed. LOL They run when the carriers come out though. Not only that, but your Mom doesnt even let you sign your mail! a pawprint would do it! Oh my gosh…………..what a sweetheart!!!!! I think all of our fur babies do this! I better not let Honey see this post. She hasn’t tried to hop into my luggage yet and I don’t want her getting any ideas. Have a great event in IL. Please tell Madison that I understand that whole being left at home feeling. I’d forgotten about Premoistened fabric, yes that is an important feature to loose. And the 2nd picture didn’t come through, I’ll check the blog, bet it’s there. And will you be going to Chicago for the big show? Can’t go this year, we have a First Communion and that’s a biggie for her. Have fun, give Madison loves for me. Madison, you are a fine dog! Mom will be back real soon. You know she loves you wayyyyyy too much to leave you for very long. Just take care of things at home and she’ll be back in a few days…. Maybe have a doggie treat or two to pass the time. From Kira, Dyanna’s red Dobie girl who has her mom well trained. Poor Madison. If that sad look doesn’t work on Mom, nothing will!! Oh, Maddy, if Mom had seen that picture of you, with those soulful eyes, she would surely change her mind! i’m 12 1/2 and I melted! Madison…DEMAND that Mommy put the first picture of you as the background on her laptop. That way you can “watch” her and remind her what she left behind. By the end of her trip she will be begging to come home to you. No one can look you in those beautiful eyes and not miss you! Poor Madison. Hang in there; Mommy will indeed return and I know she’ll have missed you! This dog is hysterical! He writes so well! My mini poodles always know what’s going on when the suitcases come out, too.. I used to have a Chesapeake Bay Retriever named Drummond, who, when the suitcases came out, would race to the door and lie down to barricade it so no one could leave. You might try that also. I love to hear from Madison T. Dog. His emails make my day!! LOVE HIM!! Madison, we have great empathy for you. This same thing has been happening to us a lot lately. Mom and Dad are getting our old house ready to sell that is 4 housrs away by car and told us that people who buy new houses don’t want to see dog hair in the house and other dog unmentionables on the lawn. So, while they clean and do yard work, we have to stay home. Dad built us this place to stay while they are gone, he calls it a Dog Run. It’s under our deck. There is some cement, some grass and the door is open to the wood shop where our beds and water are kept. We call it DOG JAIL! It is colder than the house and even though Mom and Dad leave the radio on and we have a night light, it’s just not like being in the house. We do have a nice dogsitter named Mary who makes sure we have our meals and that Molly takes her pills. But, it’s just not the same. We miss Mom and Dad…….. If your Mom ever wants to teach here in California, you can come and stay at our house, Madison. We would love to have you to play ball with and take walks. Okay? Oh Madison, you make me smile! Give it a try – you never know! “Soulful” eyes will do it everytime for me. Brady and Casey, out two Cairn Terriers, lay/sit next to the door leading to the garage if they see us get our suitcases out. They know it is a “road trip” and we literally have to trip over them to get to the car. I think Brady prefers that I stay home so he can ride “shotgun” in the front seat. Our little furry children. Love, love them. Poor Madison … Madge, June, & Britt are very sad for you and think that you should come to Florida to vacation with them when your Mom leaves you alone. They are very helpful in the quilting room with their Mom too … They always lay under the sewing table curled around the foot pedal. Is there such a thing as a Quilting Service Dog? poor madison – – – keep your chin up, your mom will be home soon and maybe she will bring you a treat for being so good while she is away. I think you are both terrific. Madison tell your Mom that they let dogs ride on airplanes now. Under the front seat might be a tight squeeze. Maybe she could tell the airlines that you were a “seeing quilting eye” dog and they might let you ride in a seat. If I had a daughter (instead of three terrific sons) I’d want her to be like AMI. I also have two darling daughters-in-law and 6 adorable grandchildren. And, a dog like Madison. 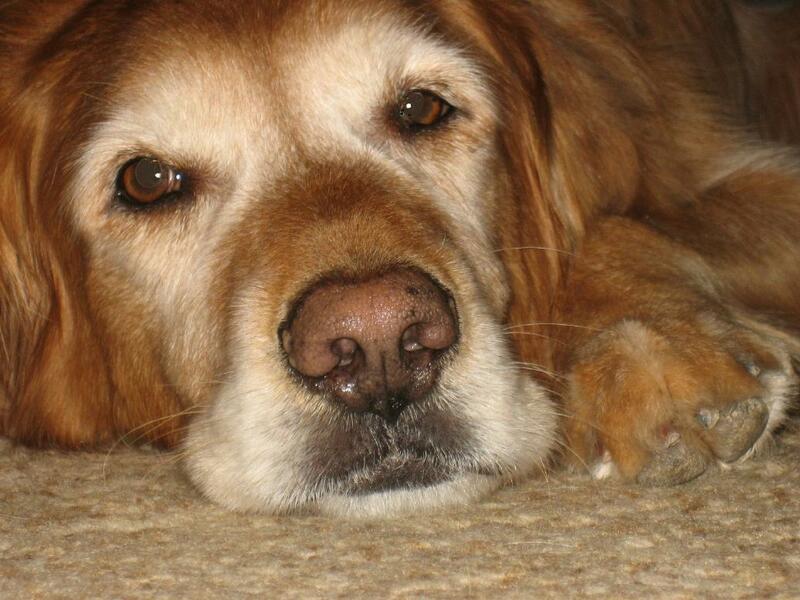 (Our Sandy Dog went to doggy Heaven.) She did not like suitcases either, but loved to ride in the car and would sit in the drivers seat every time I took her for a ride – after I got out of course. She looked a lot like Madison and thought her place in the house was in the middle of the kitchen floor. We are soooo sorry your Mommy is not taking you with her. You could always teach her a lesson while she’s gone by knocking over all her potted plants. That worked for KC, one of our cousins in Tulsa. It made his Mommy think twice about leaving him alone. Of course, that didn’t end too well for KC. His Mommy left him with someone that doesn’t travel very often and then forgot to pick him up!! Next time your Mom comes to Dallas you need to come with her and stop by for a visit. We’ll let you pre-moisten all of our Mom’s fabric for her since she hates ironing and it will probably make the job easier!! Madison, I have a Golden ACHIEVER like you. His name is Jack and I call him a Golden Achiever because he is so helpful. He carries in my quilting magazines from the mailbox and even some of my quilting bags after a day of quilt hopping. He loves his mommy and gets very sad when I go on quilt retreats. He knows when the suitcase comes out of the closet that I’m leaving him. He has tried to hide in my suitcase before. I wish you and Jack could meet and exchange stories. Lucky you, he only puts things in and out of suitcases. When our suitcases come out, our kitties know that we are leaving so they pee in them if we let them open. What a mess! We try to remember to keep them closed but sometimes forget. They are so quick that we never see them do it. Bummer! these pictures make me want to cry. Our beloved Rosie who went to Heaven in November looks just like Madison. There’s nothing better than a golden retreiver. Tooo funny! Makes me want a dog too. Unfortunately, the reigning ‘princess’ of our household Wrigley the Cat would NOT approve. She spends lots of time supervising my quilting activities as it is. Did I ever send you the photo of her helping me to put binding on a Turtle Quilt? It’s great! Hugs Madison. I would take you wherever I go, if my boss would let me. Just LOOK at that face…?! Oh my! How do you leave him, Ami?! Madison, My mommy leaves me too. I know I can fit in her suitcases, but she always finds me in there. I try to look like a sweater, but mom knows that she doesn’t own any sweaters that shed or have noses. Maybe we should start our own doggie retreat for quilting mom that leave us behind. Maybe we can lecture about our quilting mommies. We could give treats out and play with stuff for the entertainment part of the meeting. Whatcha think??? Oh my, what a love bug face!!! Madison is a looker! Goldens really are fantastic, Heck, all dogs are (although I’m partial to the bigger dogs vs the minis). P.S. For what it’s worth….I firmly support the idea of a dog friendly quilt shop / teaching gig!!! We would love to have you come to Kernersville, NC next week when your Mommy comes here to teach all the ladies in the Heart of the Triad Quilt Guild. We hate it when our Mom goes to quilting stuff, too, even if it’s just for the day. She tries to make the separation bearable by leaving the all-day buffet full, and we have our comfy beds & rugs, but it’s just not the same as having her here all day to give us treats & pet us. If your Mommy would let you come with her, you could stay here with us & play frisbee, chase rabbits, bark at our neighbor (we don’t like him at all), or take a swim in the kiddie pool on those hot days. Or, if you’d rather just hang out inside, we can find a cozy spot in the sewing room or the den. awwww….how cute! Doesn’t it make you want to take him along?? 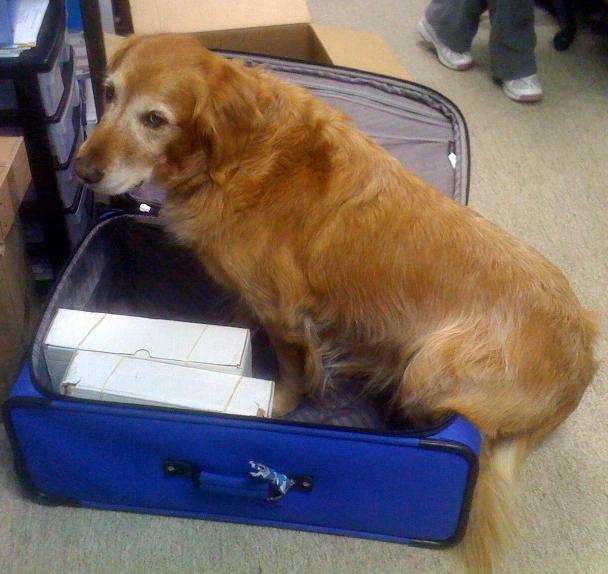 At least your dog just gets into the suitcase. My cats used to pee in mine if I left it open.